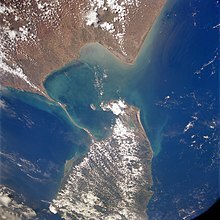 Palk Strait is a strait between the Tamil Nadu state of India and the Mannar district of the Northern Province of Sri Lanka. It connects the Bay of Bengal in the northeast with the Palk Bay and then with the Gulf of Mannar in the southwest. The strait is 33 to 50 miles (53 to 80 km) wide. Several rivers flow into it, including the Vaigai River of Tamil Nadu. The strait is named after Robert Palk. He was a governor of Madras Presidency (1755-1763) during the Company Raj period. On the southern end of the strait is a chain of low islands and reef shoals. These are called Adam's Bridge. This chain goes between Dhanushkodi on Pamban Island and Mannar Island in Sri Lanka. The shallow waters and reefs of the strait make it difficult for large ships to pass through. ↑ "Adam's bridge". Encyclopædia Britannica. 2007. Retrieved 2007-09-14. This page was last changed on 21 March 2013, at 20:15.